Copyright © 2013 M. Ruhul Quddus et al. This is an open access article distributed under the Creative Commons Attribution License, which permits unrestricted use, distribution, and reproduction in any medium, provided the original work is properly cited. Struma ovarii often escapes recognition during intraoperative consultation because of its rarity, subtle characteristic gross appearance, and lack of clinical suspicion. An intraoperative diagnosis of benign struma ovarii enables the general gynecologic surgeon to continue the planned surgery. However, a diagnosis of malignnancy in a struma ovarii would alter the course of surgery with the involvement of a gynecologic oncology surgeon. We present here that our experience with intraoperative consultation for preoperatively undiagnosed struma ovarii presenting as an adnexal cystic or solid mass at our teaching hospital. Fifty-three cases of struma ovarii, 5.2% of all cystic teratoma of the same period, were diagnosed between January 1991 and March 2011. All intraoperative consultation reports, gross descriptions and final pathology reports were reviewed. The H&E stained slides and in selected cases, immunohistochemistry stained slides, were reviewed. Of the 53 cases of struma ovarii, intraoperative consultation was requested on 48 cases. Frozen section was done on 24 cases and only gross examination was felt appropriate in remaining 24 cases. 83% cases were diagnosed when a frozen section was done. None of the remaining 24 cases were recognized as struma by gross inspection. Our findings reveal that in a large number of cases the diagnosis of struma ovarii remained unrecognized during intraoperative consultation, indicating its often subtle/deceptive gross morphologic appearance. However, the purpose of the intraoperative consultation was served, as appropriate information was provided to the surgeon to guide the surgical manage- ment. Struma ovarii, the most common monodermal teratoma, is a relatively uncommon tumor and comprises less than 3% of all ovarian teratomas . Because of the rarity of this tumor, only two large series have been published so far in the English literature, both by Scully and his colleagues [2,3]. Another series of proliferative and histologically malignant struma ovarii was published by Tavassoli and her colleagues . Most others are single case reports. Several other reports on various features of strumal carcinoid are available in the literature [5,6]. The term “struma ovarii” is reserved for a teratoma which is composed entirely or predominantly of thyroid tissue. The tumor is usually unilateral. However, there is one report in which the contralateral ovary with a teratoma contained thyroid tissue . Struma ovarii has been reported to be present in association with other neoplasms. Association with mucinous cystadenoma , Brenner tumor  was reported. The other potential pitfall of struma ovarii, especially on frozen section, is that clear cell carcinoma may mimic struma ovarii . The tumor may present as a solid or cystic lesion. When predominantly cystic, it may be unilocular or multilocular. When the cyst is large, the epithelial lining of the wall may become attenuated, making the diagnosis difficult on hematoxylin & eosin stained slides. Immunohistochemical staining for thyroglobulin is required to confirm the diagnosis in these cases . The deceptive gross appearance, similarity to other benign ovarian lesions, and lack of preoperative clinical suspicion appears to be the reasons precluding recognition during intraoperative consultation. We describe here our experience with intraoperative consultation on adnexal masses without any preoperative diagnosis and 53 cases of struma ovarii diagnosed incidentally in our teaching hospital during the past 21-year period. A computer search identified all cases of struma ovarii from the files of the Department of Pathology, Women & Infants’ Hospital of Rhode Island, from January 1991 and March 2011 after obtaining approval from the Institutional Review Board (#13-0005). Also identified were all cases of cystic teratomas diagnosed during the same time period. The frequency of struma ovarii among cystic ovarian teratomas was determined. All intraoperative consultation reports and final diagnoses were compiled. The gross description of the tumors and the association of struma ovarii with other tumors were noted. Hematoxylin and eosin stained slides and, when available, immuno-histochemical stained slides, were also reviewed. Only those teratomas consisting entirely or predominantly of thyroid tissue were included in the study as struma ovarii. Mere presence of thyroid tissue in a teratoma did not fulfill the diagnostic criteria, and were excluded. The radiological impression when available and pertinent clinical features were noted. A total of 53 cases of struma ovarii and 1019 cases of cystic teratomas were identified during the 21-year period. Struma ovarii constituted approximately 5.2% of all mature cystic teratoma. The tumors occurred in women 12 to 81 (median 45) years of age. Sixteen patients were post menopausal, 29 patients were premenopausal and 8 patients were perimenopausal. Of the 53 cases, 50 were benign tumors and three strumal carcinoid tumors were diagnosed. All patients presented with an adnexal mass. Twenty nine of 53 cases involved the left ovary, 22 involved the right ovary and two cases had bilateral involvement. Thirty two of 53 cases were cystic and 2 cases were entirely solid and the remaining 19 cases had solid and cystic areas. Intraoperative consultation was sought for 48 cases; the remaining 5 cases were not seen perioperatively. Three tumors were associated with fibroma and one Brenner tumor respectively. Three others which were thought to be associated with serous cystadenomaand later were found to stain positively with thyroglobulin, indicating a cystic component of struma ovarii. All 48 cases were examined grossly and frozen sections were performed on 24 cases when it was deemed necessary by the pathologist. In one case, despite the gross impression of serous cystadenofibroma, a frozen section was performed, which revealed struma ovarii. Twenty of 24 (83%) cases were diagnosed accurately by frozen section and none of the remaining 24 cases were recognized by gross inspection during introperative evaluation. The grossly examined cases were thought to be benign cysts in 21 cases and 3 as serous or mucinous cystadenoma/adenofibroma. One case on frozen was thought to be granulosa cell tumor, later confirmed by immunohistochemical stain as struma ovarii. The gross appearance, opinion of the radiologist, gross impression and frozen section diagnosis of all 53 cases are tabulated in Table 1. The typical textbook description of struma ovarii refers to a unilateral tumor of varying size, usually measuring less than 10 cm in diameter. When associated with other elements, the size may be larger . The exterior surface is smooth, although fibrous adhesions are not unusual. Upon sectioning, the cut surface may be entirely cystic or solid or both. The thyroid tissue is usually brown or green brown, predominantly solid, and gelatinous . Hemorrhage, necrosis and foci of fibrosis may be present. Solid tumors are less glistening and fleshy. 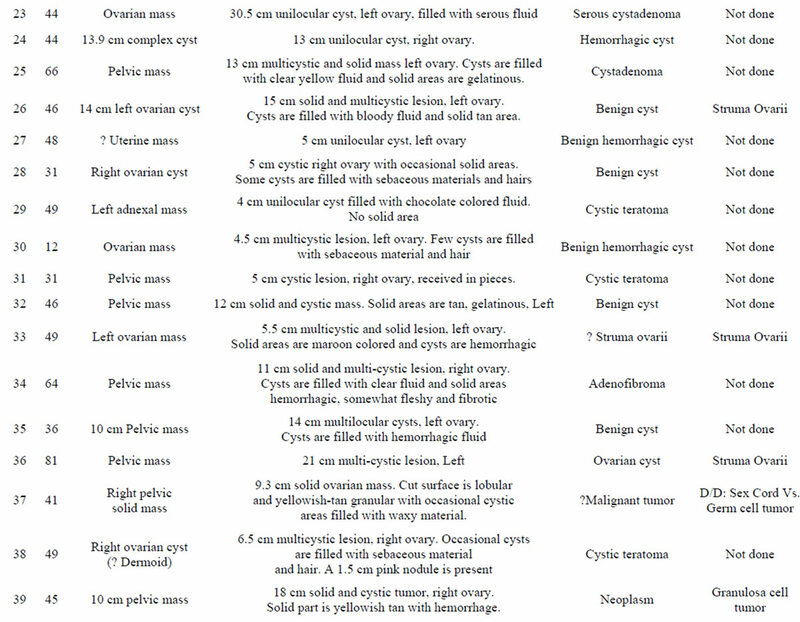 In our review, we found a variety of gross appearances of struma ovarii, the majority of which did not fit the typical description found in the literature. Thirty two of 53 cases (60%) in our study were entirely cystic. The majority of these were multilocular and 4 (19%) were unilocular. Nineteen cases (36%) were cystic and solid and only two (3%) were entirely solid. 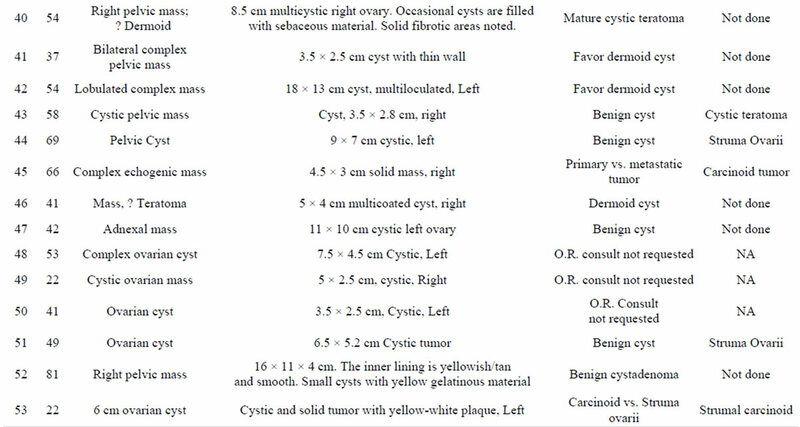 Typical greenish or brown green cysts were present in only 4 (7.5%) cases. A gelatinous appearance was noted in 7 (13%) cases either in association with greenish cysts or in isolation. The characteristics of the cyst contents were also variable. The cyst contents in 18 of 53 cases (34%) were found to be clear or yellowish/serous; in 4 (7%) hemorrhagic; and in 1 (0.4%) case, mucinous. The appearance of the remaining 3 cyst contents was not known to us as the cysts were either collapsed when received or taken out in pieces during surgery. Of the 4 tumors with hemorrhagic cyst contents, only one was due to torsion. The reason for hemorrhage within the cyst was not clear in the other 3 cases. The two entirely solid tumors were thought be a non-epithelial ovarian tumor on gross examination. However, after frozen section, a differential diagnosis of struma ovarii versus strumal carcinoid was rendered. It was felt during intraoperative consultation that additional sampling and special stains were necessary to confirm the diagnosis. Table 1. Master table with gross and intraoperative impression. ovarii during the intraoperative consultation. In our experience, 20 of 24 (83%) cases were recognized when frozen section was done. However, none of the remaining 24 cases was recognized as struma ovarii when examined by gross inspection only. A significant number, 21 of 24 (88%) were thought to be benign cysts and remaiing 3 of 24 (12%) cases were thought to be serous or mucinous cystadenoma on gross examination and no frozen section was performed. Three cases (14%) were gritty to cut and felt to represent components of a mature cystic teratoma intraoperatively. On final sections, however, these were found to be calcifications in a struma ovarii. Intraoperative consultation was requested in view of absence of preoperative diagnosis, as all cases were presented as adnexal masses of varying size. While performing the intraoperative consult some cases were diagnosed by gross impression only and others after a frozen section. Frozen section was performed in the latter cases to rule out any malignancy or in a few cases, at the request of the surgeon. In our experience, performing a frozen section may not always resolve the diagnostic dilemma, but often may help increase the diagnostic accuracy, as was found in one of our cases. Despite the gross appearance of a serous cystadenofibroma, a frozen section was performed and the diagnosis of struma ovarii was made. The only solid case in our series was felt to be either a struma ovarii or strumal carcinoid during intraoperative consultation. Frozen section examination did not resolve this issue. Frozen section of another case revealed serous adenofibroma, but additional permanent sections revealed struma ovarii. Presence of extensive fibrosis and selection of an inappropriate area in the tumor led to the erroneous diagnosis during intraoperative consultation. Two tumors were diagnosed on permanent hematoxylin and eosin stained section as serous cystadenoma, but later found to represent cystic struma ovarii. Both these two tumors were predominantly cystic with minor component suggestive of glands containing colloid. Thyroglobulin staining by immunohistochemistry is essential to confirm struma ovarii in these suspected cases. Special stain was performed to confirm that the larger cysts were also component of struma ovarii as suggested by Szyfelbein, et al. . One also must pay attention not to miss clear cell carcinoma as it may mimic struma ovarii . Association of struma ovarii with Brenner tumor is rare and one such case was identified in our series. Association with fibroma was not previously reported in the literature. We had one such association in our series. It is interesting that all cases in our series were benign tumors in contrast to earlier reports. A possible explanation could be that all the current cases are hospital cases only, where as, the other published reports included consultation cases. The radiological impression of most of the cases was a complex adnexal cyst, which did not help the pathologist or the surgeon to arrive at a diagnosis of struma ovarii preoperatively. Struma ovarii, being a teratoma, could potentially be a bilateral tumor. Its proper recognition during intraoperative consultation may help the general surgeon to seek consult of a gynecologic oncologist to evaluate the contralateral ovary more closely. A diagnosis of benign cyst does not convey the appropriate message to a general surgeon. It is reported in the literature that the likelihood of a cystic teratoma being bilateral is 8% - 15% , while only 2% - 3% of mucinous cystadenomas and 12% - 20% of serous cystadenoma were bilateral . In our series, one patient had bilateral teratoma at presentation (Case 13) and in another patient (Case 17) the contralateral ovary was found to be involved 6 years later. We believed the tumor in the contralateral ovary was not recognized during her initial surgery as struma ovarii was not diagnosed during intraoperative consultation and the finding may have been overlooked. An accurate intraoperative diagnosis of benign struma ovarii is somewhat an academic exercise as it does not provide any crucial information to the surgeon so that he has to change his course of surgery. However, it is important for the surgeon to know that the tumor is benign. It is also important that struma ovarii should be differentiated from clear cell carcinoma on frozen section as the management is different in those two tumors. Despite the potential pitfall none of the cases in our series was over diagnosed as clear cell carcinoma. 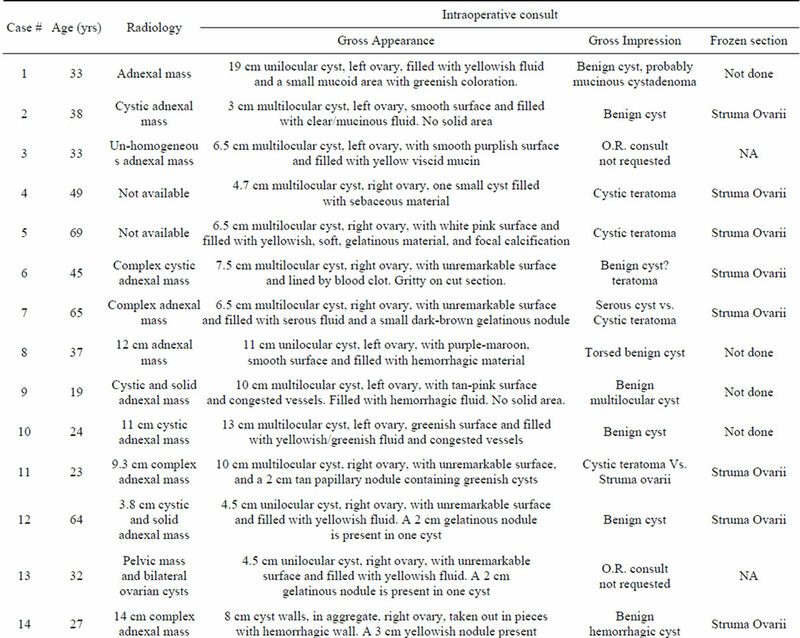 It is worth mentioning here that none of the 53 cases had any preoperative diagnosis and intraoperative consultation was requested to arrive at a diagnosis and to rule in/out malignancy. We have observed in our study that the diagnosis of struma ovarii escaped recognition in half of the cases during intraoperative consultation. It appears that doing frozen section improves the diagnostic accuracy of struma ovarii significantly when compared with gross examination. In our series, we feel that the purpose of intraoperative consult was served as malignancy was excluded and useful information was provided to the surgeon in the operating room. Gusberg, S.B. and Danforth, D.N. (1944) Clinical significance of struma ovarii. American Journal of Obstetrics & Gynecology, 48, 537. Stagno, P.A., Petras, R.E. and Hart, W.R. (1987) Strumal carcinoid of the ovary. An immunohistochemical and ultrastructural study. Archives of Pathology & Laboratory Medicine, 111, 440-446. Terada, T. and Tateoka, K. (2012) Ovarian cystic tumor composed of Brenner tumor and struma ovarii. International Journal of Clinical and Experimental Pathology, 5, 274-277. Young, R.H., Clement, P.B., Scully, R.E. (1994) The ovary. In: Sternberg, S.S., Ed., Diagnostic Surgical Pathology, Raven Press, New York, 2252-2253. Peterson, W.F., Prevost, E.C., Edmunds, F.T., Huntley, Jr. J.M. and Morris, F.K. (1955) Benign cystic teratomas of the ovary. A clinico-statistical study of 1007 cases with review of the literature. American Journal of Obstetrics & Gynecology, 70, 368.